Lovely floral prints adorn the aanchal of the sari. 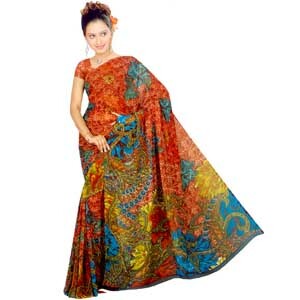 A mixture of bright and bold colours make this sari quite eye-catching. Give a grand new look to your beloved in Indore. Make her love you all the more. Send her exclusive Gifts to Indore along with this beautiful saree.